Boating opportunities abound in Vermont. There are lakes and rivers for large craft and smaller streams and ponds for smaller vessels. 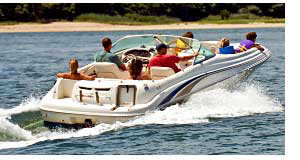 Some allow power boats, others only allow electric motors, each providing a unique experience. Fishing and other watersports are available at most boating lakes throughout the state - depending on time of year and state-defined seasons. Use the map below to locate lakes and rivers nearby major cities including Burlington, Shelburne, St Albans, Vergennes, Waterbury, Barre, Lyndonville, Montpelier, Morrisville, Newport, Bennington, Brandon, Fair Haven, Rutland, Wells, Hartford, Randolph, Springfield, West Brattleboro and Wilmington. Use the navigation and zoom arrows to locate your area of interest in Vermont. Once you locate a specific area or city, zoom in closer and make note of bodies of water nearby. The scale on the map allows you to determine the length and width of the waterway and define its potential usability for boating with your particular watercraft. Always check with local water authorities for current lake levels. Some of the lakes in Vermont include Arrowhead Mountain Lake, Colchester Pond, Fairfield Pond, Lake Carmi, Lake Champlain, Island Pond, Lake Memphremagog, Lake Willoughby, Maidstone Lake, Seymour Lake, Lake Bomoseen, Lake Dunmore, Lake St Catherine, Silver Lake, Somerset Reservoir, Chittenden Reservoir, Harriman Reservoir, Kent Pond, Lake Rescue and Woodward Reservoir. Navigable rivers include Missisquoi River, Winooski River, Barton River, Clyde River, Mettawee River, Otter Creek, West River and White River. Maps for boating in other states.